HOSTAFRICA is based in Cape Town and provides high performance servers and hosting solutions at highly competitive and truly affordable rates. With more than 20 years of combined experience, HOSTAFRICA established its services and consistently provides outstanding quality to its customers. Our exceptional team consists of skilled developers, administrators and managers from Germany and South Africa. HOSTAFRICA’s, CEO Michael Osterloh worked for “Deutsche Börse Cloud Exchange AG” as Managing Director whilst Marcel Chorengel not only founded one of the largest German providers of virtual servers but also developed the first fully automated webhosting software (Confixx). At the end of 2015 HOSTAFRICA acquired the hosting company “Cloud to Machine Pty Ltd” (Joburg) from Chris Kruger (South African) , who joined HOSTAFRICA and supports our strategic development section. In December 2016 HOSTAFRICA acquired VPS Networks (cloud.co.za and vps.co.za). As one of only a few providers HOSTAFRICA offers Virtual Server (VPS) that are conveniently located in South Africa and Europe. By establishing the server location in South Africa we achieved the highest speeds for local accesses. If your customers are based in Europe, you can utilise our Data Center centrally located in Europe in Dusseldorf, Germany. Both locations are optimized for reliability and high availability. We only use well-known brand hardware and software solutions. 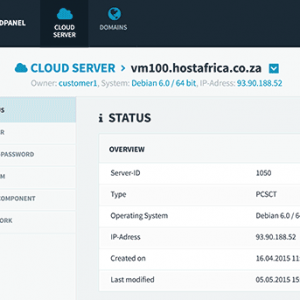 We have developed the intuitive “HOSTAFRICA CloudPanel” for our customers, that not only enables them to manage their servers easily and conveniently but also without the need for specialist server administrational skills. It’s really quite simple to start, stop or reboot the system! Developers and Administrators can also use the API functionality with all features of the CloudPanel. Our team has configured more than 1,000 servers and our customers benefit from our “hands on” Know-How. You can reach our hosting experts 24 hours a day, 7 days a week. With HOSTAFRICA your web applications are guaranteed to be 99.9% online and available. Daily Backups and redundant systems are standard at HOSTAFRICA. Our VPS solutions are efficient and reliable and our services are offered at competitive and affordable rates. HOSTAFRICA’s, CEO Michael Osterloh worked for “Deutsche Börse Cloud Exchange AG” as Managing Director whilst Marcel Chorengel not only founded one of the largest German providers of virtual servers but also developed the first fully automated webhosting software (Confixx). At the end of 2015, HOSTAFRICA acquired the South African hosting company Cloud to Machine Pty Ltd. This was the beginning of a partnership between Michael Osterloh and Chris Kruger that has seen HOSTAFRICA become not only a VPS provider but also a strategic partner to our customers. We deliberately deploy SSDs because they are 20 times faster than standard SATA disk drives. Also, our static IPv4 is included however you can order more IPs if your business expands. Our infrastructure and security systems are of such a high standard that we can guarantee 99.9% uptime. We support all your business hosting needs so if you require more power we can upgrade your plan or create a bespoke offer that meets your specific needs. What’s more, no matter how you utilise our services, you have peace of mind that your data is always backed up and that you can run a back-up or restore your systems at any time. Finally we understand that circumstances can quickly change and that your needs and requirements might differ from one day to the next. Therefore, should you no longer require our services we allow you to cancel your contract at any time with no penalties or nasty business. HOSTAFRICA servers are designed by German cloud computing pioneers.